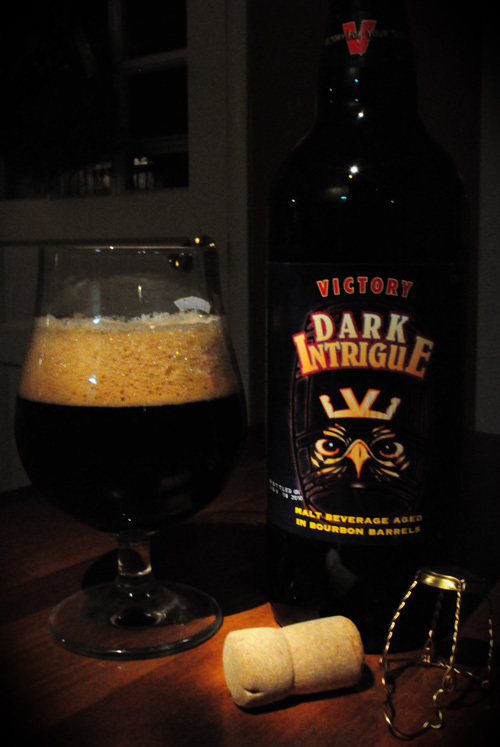 We have extolled the virtues of the terrific Victory Brewing Company on more than a few occasions here at Aleheads, so it was with great enthusiasm that my loyal local beermonger set me aside a bottle of Victory’s Dark Intrigue – a bourbon barrel-aged apotheosis of the outstanding Storm King Stout. I had every intention of laying this one down for a year or more. Chilly nights prevailed, however, and the result was a boozy, but enjoyable foray into a world of malty, roasty, whiskey goodness. Notes: Bomber procured at Charles Street Liquors; imbibed at Castle von Brue. Head: One and a half fingers of fluffy mocha head that yielded to sticky, soapy lacing. Nose: A smack across the face from aggressive bourbon notes slowly transformed into solid olfactory complexity characterized by oak, coffee, vanilla, roast, and just a hint of hops. Taste: Like the nose, the brew was, first and foremost, a chewy flavor adventure into the kingdom of bourbon and oak. Vanilla, coffee, and chocolate prevailed, however, with a red hot alcohol burn. It’s amazing that this beer went into the barrels “Storm King” and emerged a new beast entirely. Drinkability: Mid-Low. Although the bottle was a true treat, the booziness of the bottle make this monster a sipper for crisper evenings. Rating: 3 hops. A nice example of the increasingly crowded field of great imperial stouts aged in oak. Posted in Tasting Notes.Tagged Dark Intrigue, Storm King, Victory. I of course want this beer and will seek it out, because it’s Victory and they rule, but I’m becoming less and less interested in these boozy oak-aged offerings. Don’t get me wrong, they’re cool in their own right, just not something that I need to drink every day. That’s probably the whole point I guess. The beer isn’t meant to be drunk like an everyday beer, but to me EVERY beer has the potential to be an EVERYday beer if you can stomach it every day. I can’t drink these every day. Couldn’t agree more, Doc. It’s tough for me to stomach 22 oz. of barrel-aged or barleywine, but every now and again it drinks just right. My cellar is currently full of boozy whiskey stouts that I’m counting on you to split, though, so we both need to sack up. Warm days on the horizon.